The Cadet Nurse Corps, established by the Nurse Training Act of 1943, recruited women between the ages of seventeen and thirty-five to be trained as nurses. First Lady Eleanor Roosevelt insisted the act be amended to prevent racial discrimination. As a result, more than 3,000 minorities served as cadet nurses, including Japanese women recruited from relocation camps. Those accepted into the program received subsidized and expedited education and, in return, agreed to serve under the US Public Health Service for the duration of the war. These student nurses served on the home front in military and civilian hospitals as well as public health clinics and the Indian Health Service. They replaced graduated nurses who joined the Armed Services. By the end of the war, more than 180,000 student nurses served in 2,000 hospitals. This poster highlights the "girl with a future" and a "lifetime education," suggesting that these recruits were not just to serve for the duration of the war, as was expected for many women who took jobs in factories and other fields dominated by men. The possibility of a lifetime career was part of the draw for the young women who signed up for the nurse corps. The US Cadet Nurse Corps has been highly successful. . . . Our best estimates are that students are giving 80% of the nursing in their associated hospitals. By replacing graduate nurses who already have gone into the military, the US Cadet Nurse Corps has prevented a collapse of the nursing care in hospitals. Read the introduction, view the image, and apply your knowledge of American history to answer the following questions. 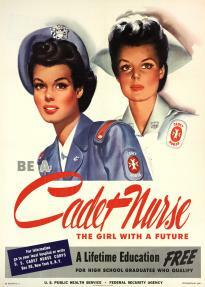 Why did the US Public Health Service recruit cadet nurses in 1943? Describe the incentives that were offered to young women to join. For each incentive that can be identified, explain why it was a particularly attractive offer. How effective was the technique used by the artist and the text on the poster? How might First Lady Eleanor Roosevelt have changed the poster wording and image?